The American mainstream media, reflecting deeper currents in American culture, typically treats "religion" as a private lifestyle choice: a personal option one may exercise to make sense out of life (and death) through certain rituals embodied in communities. That the "choice" in question has anything to do with adherence to the truth, as one is grasped and transformed by that truth; that those rituals embody religious truth in a unique way that links the believer to the very life of God; that those communities are formed by, and accountable to, truths that can be rationally explicated in a body of knowledge called "theology" -- say what? To treat religion as a lifestyle choice leaves little room for the very concept of "truth," unless it be the anorexic postmodern notion of "your truth" and "my truth" (which means that Khalid Sheikh Muhammad's "truth" is just as much "truth" as Pope Benedict XVI's). In the sandbox of self-absorption that is so much of postmodern culture, there is little or no room for the truth. "Don't Know Much about Theology ..."
The Portsmouth Institute is set to begin its third year of work from June 22-24, 2012, with the theme of "Modern Science, Ancient Faith." The Institute is located at Portsmouth Abbey and School (Portsmouth, RI). The speakers include Rt. Rev. Dom James Wiseman (St. Anselm's Abbey, Washington, DC), R. Dom Paschal Scotti (Portsmouth Abbey), William Dembski, John Haught, Kenneth Miller, B. Joseph Semmes, Michael Ruse, Fr. Nicanor Austriaco, OP. Prayer, fraternity and time to think are hallmarks of the Portsmouth Institute. Situated at the beautiful Portsmouth Abbey on the Narrangansett Bay, who could not love expanding one's thinking on faith and science. Visit the website noted above for more information of the conference, the Abbey and School. 2009 The Catholic William F. Buckley, Jr. 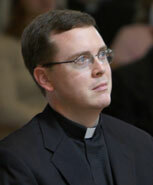 The century old magazine edited by the Jesuits, America Magazine, has a new editor in chief, Father Matthew Malone, SJ. He's the 14th editor, and the youngest in the publication's history. America is a mixed bag of journal opinion when it comes to covering the Church, it mostly pushes the envelop on matters that are not up for debate: it sheds more smoke and than light. In many ways it seems as though America has abandoned it's prestigious and valuable nature of journalism as a Catholic publication rooted firmly in Ignatian spirituality. I pray that Saint Ignatius and all Jesuit saints and blesseds inspire Father Matt in his new mission. I certainly wish him the best. America's press release is here. This page is a archive of entries in the Faith & Reason category from June 2012. Faith & Reason: April 2012 is the previous archive. Faith & Reason: July 2012 is the next archive.